Is This the Single Most Important Statistic About Millennials? The U.S. Council of Economic Advisers just released a fascinating report about Millennials, packed with statistics about their demographics and economic prospects. It charts a lot of differences between Gen X and Millennials, but there's one statistic that reveals a true generation gap. What you can see in this simple pie chart comparison, above, is the enormous shift in the U.S. population that took place between the days when Gen Xers were kids and today. In 1980, the year that The Empire Strikes Back came out, 78% percent of 15 to 34 year-olds identified as white. 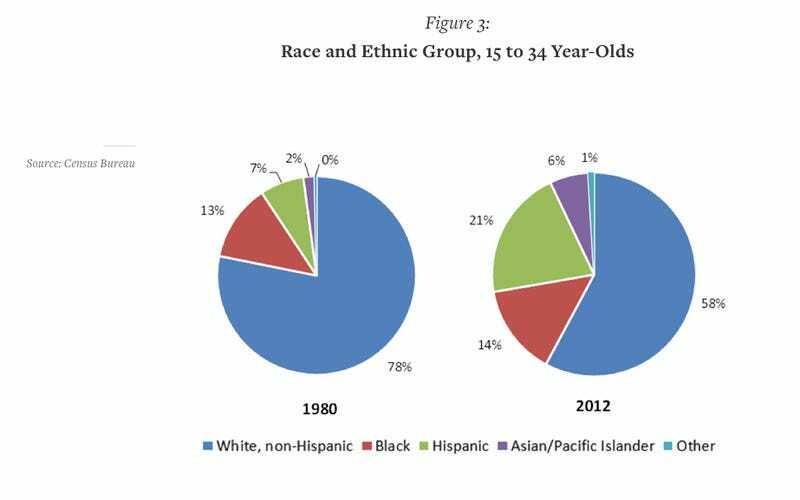 In 2012, just 32 years later, only 58% identify themselves as white. This doesn't just reflect a change in the size of the white population. It also means that white Millennials are much more likely to know and have friends who are people of color. Millennials live in a U.S. where it's harder for white people to live in a place where they never meet someone with a different racial background than themselves. (Of course they still can and do, but it's just pragmatically more difficult.) Put simply, it's no longer easy to claim whites are the "norm." Increasingly, they're just part of the mix. There are other differences between Gen X and Millennials detailed in the report, but none are this radical. Millennials tend to value extended families slightly more than their elders, and stay in jobs for longer. They are also looking at more difficult economic prospects than Gen X did — which is particularly disturbing, given that the 1990s were full of rhetoric about the "downward mobility" of Gen X. Millennials are basically continuing a trend that began in the late twentieth century, when the U.S. middle class began to shrink. It's possible that this demographic shift in race and ethnic groups may represent the biggest gap between Millennials and previous U.S. generations. And it may account for some of the conflicts that are beginning to take shape between 20 and 30-somethings and people who are older.